Primary schools all over Australia are sure to snap up this well-designed and comprehensive large format book. Filled with coloured pictures and photographs (some of them historical), the book takes the reader through the story of conflicts that Australia has been involved in. It shows how our country honours, thanks and remembers those who fought to protect others, or suffered in war and conflicts in the past. It explains how, from a population of five million, over 416,000 Australians volunteered to serve their country in the AIF. And how more than 60,000 of the volunteers lost their lives. 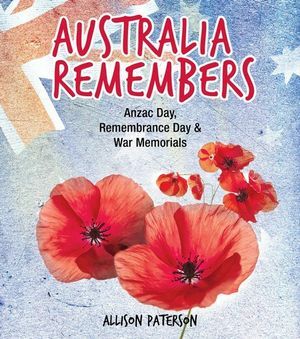 It examines the role of Anzac Day in our country’s history with numerous coloured break-out shapes that look at subjects such as the Western Front and the Middle East, mateship, the Diggers and the Anzac Spirit. It moves on to Anzac Day services, ceremonies and parades, with numerous quotes from serving soldiers and school children about subjects such as why the day is remembered. The reader is shown stories and photographs of the bugle call, dawn services, even the RSL. A large section of the book is devoted to Remembrance Day (11 November) with details such as when the Armistice was signed, the silence of respect, even the ode of Remembrance and why poppies are important. More than one chapter is devoted to war memorials across Australia, with additional information about the Vietnam War (1962-73), Afghanistan 2001 (ongoing), and another war on terror, Iraq (1990-91) and (2003 – 2009). At the back of the book there is more to inform the reader, including a map showing locations where Australians serve in conflicts and peace-keeping missions. There are numerous activities included, too, such as how to make a poppy, Anzac biscuits, a wreath and even how to create a war memorial. Like all good non-fiction books there is a glossary, index and bibliography with acknowledgements and a page about the hard-working author who has also written the 2016 ABIA and CBCA-longlisted title Anzac Sons: The Story of Five Brothers on the Western Front. The book is highly recommended.